Approximately eight Airmen assigned to the 818th Mobility Support Advisory Squadron and a U.S. Air Force Chaplain recently returned from a building partner capacity mission Jan. 25 through Feb. 10, 2019. This mission was the first time a chaplain accompanied any MSAS team to Cameroon. The Cameroon forces and local personnel had the opportunity to see and hear the Air Force’s commitment to their nation and how our Constitution protects the free exercise of religion at home and abroad. Capt. Guy Kagere, a Roman Catholic priest, born and raised in the Democratic Republic of the Congo, jumped at the opportunity to return to a nearby nation in the second largest continent on Earth. Prior to his service in the U.S. Air Force as a priest, Kagere provided pastoral care ministry for nearly 17 years. He gained U.S. citizenship in 2015 and commissioned on Dec. 16, 2016 in Baltimore,Maryland. While on the MSAS mission to Cameroon, Kagere provided cultural awareness as well as spiritual guidance to help MSAS instructors with Cameroonian Air Force (CAF) personnel during the training. “Having a chaplain originally from the continent who is well versed in Francophone African culture and who spoke the language fluently was instrumental for establishing initial rapport with the CAF members,” said Tech. Sgt. Bridget Baydal, 818th MSAS logistics advisor. For the CAF personnel, training consisted of air base defense, logistics management, and intelligence support training. The key objectives of the mission involved identifying CAF personnel as instructors to create an air base defense training program, ensuring partner nation members are able to safely handle hazardous material and advising CAF on unit level Intelligence, Surveillance and Reconnaissance support. At the core of the specialty training in which the CAF received, MSAS team members strengthen relations and build partner capacity, ultimately promoting interoperability between the two nations. “Exposing our wing chaplain to the MSAS advising mission on his home continent was an awesome experience for our team and greatly impacted our mission efforts,” said Master Sgt. Roi Yeandel, 818th MSAS team sergeant. In addition to the MSAS mission, Kagere was able to join a local U.S. Army civil affairs team in visits to orphanages in Garoua, Cameroon. The civil affairs team was assisting in working to strengthen relationships with the local population while addressing community vulnerabilities and preventing extremist ideologies from taking root. “Accompanying the MSAS and civil affairs team to these missions [in Cameroon] proved to me the impact the Air Force is making around the world is bigger than all of us,” said Kagere. 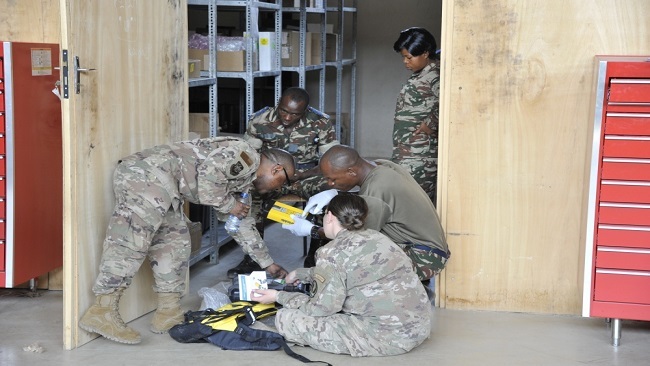 One of the 621st Contingency Response Wing’s primary lines of effort is to advise partner nations like Cameroon and provide mobility expertise to increase national security through training and execution of building partnership capacity missions anytime, anywhere.